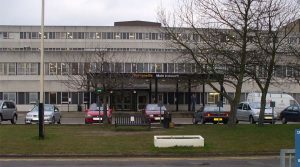 Ysbyty Glan Clwyd (Glan Clwyd Hospital), their large acute hospital complex in Bodelwyddan, opened in the late 1970s. Due to the presence of asbestos throughout the building, maintenance and upgrade work was increasingly unsustainable and a decision was made in 2009 to completely renovate the whole site. No area was left untouched by the project – one of the biggest of its kind ever carried out in the UK – to remove a legacy of asbestos, including 300,000 tonnes of waste, alongside refurbishment work and the installation of state of the art theatres and departments. The hospital remained operational for the duration of the project, as entire departments and wards were successfully decanted to enable full access for refurbishment. Our team worked closely with the BCU Capital team as well as stakeholders including BCU Operational Estates, Clinical Departments, HSE, Gleeds, Laing O’Rourke and, of course, asbestos removal contractors. With up to eight analysts and on-site management present throughout the process, we set up a UKAS accredited site laboratory where a large number of local trainees were employed. Providing this training ensured the skills needed were close at hand, with staff available for 30-minute emergency call-outs, 365 days a year over the project’s nine year lifespan. Now re-instated with the latest specifications and an external facelift, the Health Board celebrated the Glan Clywd project’s successful completion at the beginning of 2019.